Pick the Right Back Pack, Pack it Light and Wear it Right! Back to school means many children and adolescents will be wearing a back pack again. More than 50% of people experience at least one episode of low back pain by their teen years. In many cases, wearing a back pack may be to blame. Carry an overweight load unevenly or improperly can result in poor posture, joint pain, muscle strain, and headaches. 3 things you can do for Back Pack Safety! The total weight of a pack shouldn’t exceed 10% of the wearer’s body weight. So if you child weighs 100 lbs, their pack should not exceed 10 lbs! If you or your child is experiencing persistent neck, back, muscle or joint pain contact us to get it checked! 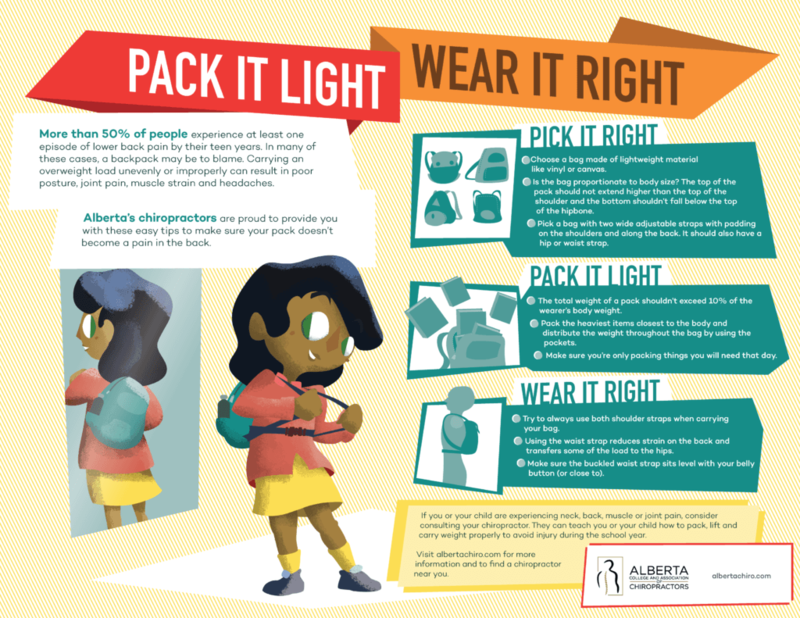 We can teach you or your child back pack safety and how to pack, lift and carry the weight properly to avoid injury throughout the school year.